If the next build you're planning doesn't have a slot for it, reconsider your motherboard purchase. 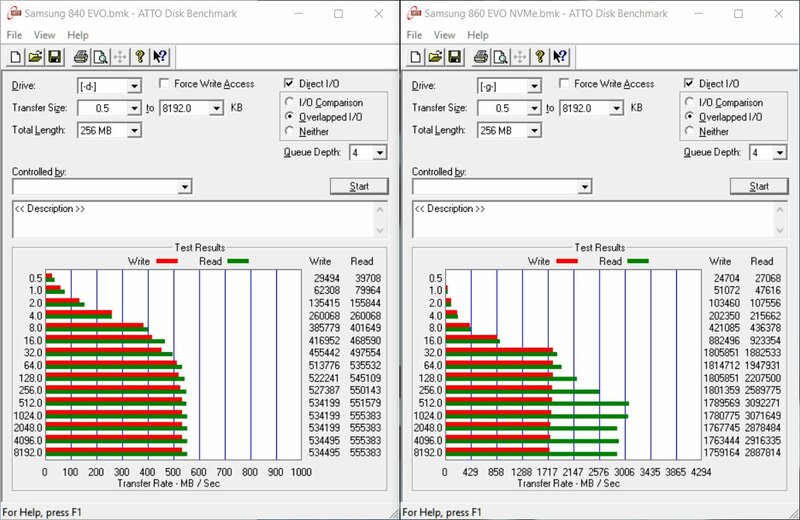 I recently bought a laptop with a couple of NVMe M.2 slots and, uh...how does 2.3Gbyte/s reads and 1.2Gbyte/s writes sound? And yes, that's gigabytes, not gigabits. Windows barely has time to even draw the spinny circle before the welcome screen pops up. I'll bet if I dropped the POST tests on this sucker from thorough to fast, or none, boot times would be nigh instantaneous. I'm having a case of serious SSD envy for my other systems now. SATA ain't fast enough, dammit. I didn't know you could control POST tests. I haven't touched anything worth more than ~$800 for the last like 15 years, so I have NO idea about half the stuff I'm missing out on when it comes to high mid range to high end stuff. Yeah, most systems will let you switch between minimal and thorough tests. Most consumer grade hardware that I've seen defaults to minimal. Thankfully, NVMe SSDs are pretty quickly approaching that ~$800 mark. They're still more expensive than SATA SSDs (seems like they're in the $0.70-0.80/GB range now) but they've come down quite a bit in the past year. M.2 PCIe slots have been getting more popular in motherboards, particularly in Skylake systems, and with the prices falling I think we're going to start seeing these more in mid-range systems in the next year or two. Here's hoping! Yeah def sounds like build is going to be on the back burner. You guys living separate atm? Yeah, I'm (STILL) living at home, but she's been living in barrie (about 50km away, takes ~45 mins to drive) since we started college in 2008. My parents let me drive one of their cars, so I didn't have to move. She doesn't drive, so she had to move close to college. 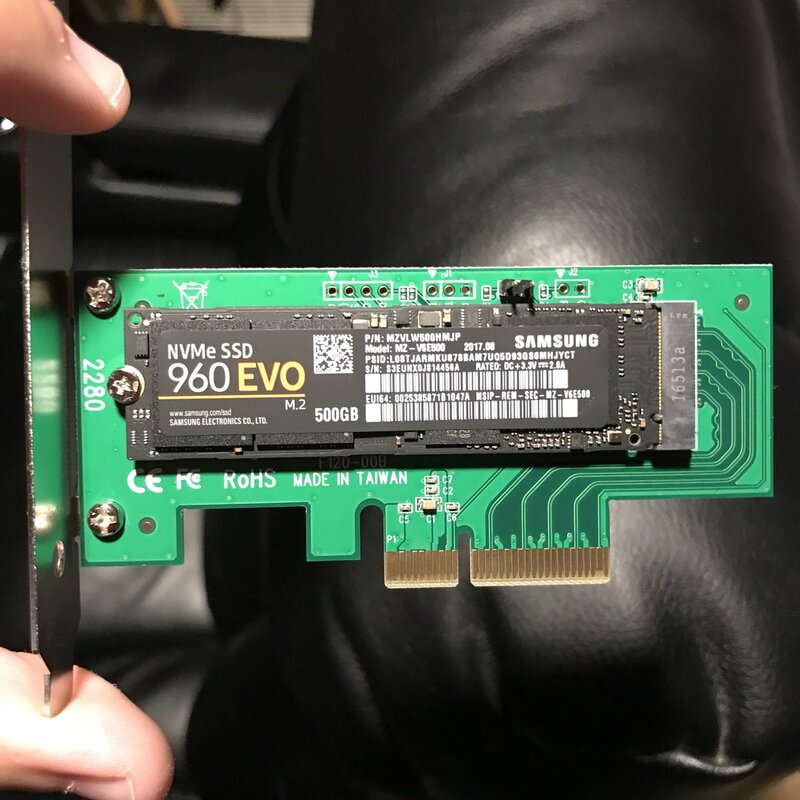 So I ordered a second NVMe SSD for my laptop as a result of a sale ($200 for a 500GB Samsung 860 EVO!). Then, after receiving it, I wondered why I ordered it since I don't really need all that much fast solid state storage in my laptop (at least, not yet). Sure would be nice if I could drop it into my gaming rig, but that doesn't have an M.2 slot. 3GB/s reads, 1.8GB/s writes. Acceptable!